Mercedes-Benz has previewed the name and appearance of its upcoming mid-sized pick-up with the unveiling of a pair of concept cars conceived to set the scene for the introduction of the company’s newest commercial vehicle model. Called the X-Class – a name it will retain for production, the new dual cab Mercedes-Benz pick-up has been depicted in two distinct forms by the German car maker’s in-house design team in the run up to a planned launch in the UK during the third quarter of 2017. As the stylish Explorer, the new Mercedes-Benz concept is said to closely preview the initial X-Class model, featuring a largely production ready steel body, an on-road road biased wheel and tyre package, moderate ride height and a luxurious leather lined interior. 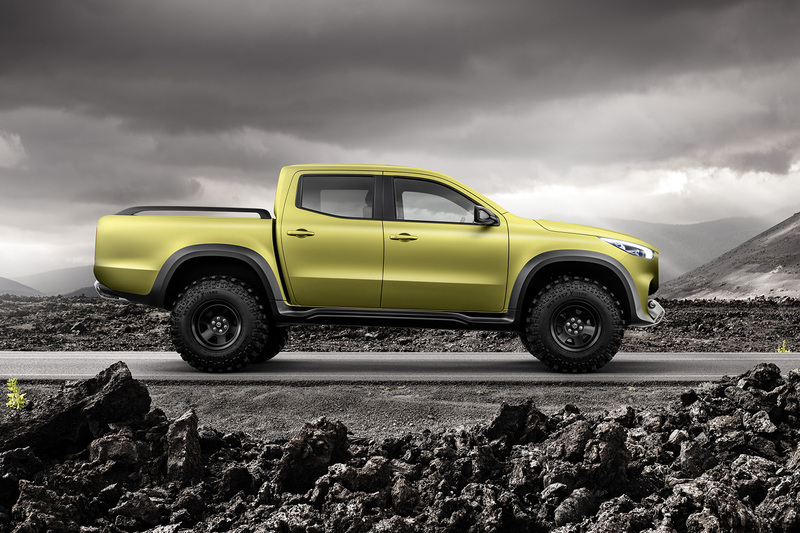 A second variant of the new Mercedes-Benz, the Adventurer, sets out to project a more rugged for the X-Class in a concept that appears ready to storm the desert with generous ground clearance, four-wheel drive, additional wheel arch and body side cladding and off-road wheel and tyres. The new Mercedes-Benz has been developed in a three-way joint venture with parent company Daimler’s alliance partner Renault-Nissan. It will be produced alongside its sister models, the Renault Alaskan and Nissan Navara, in factories in both Spain and Argentina. The design of the X-Class remains true to a series of sketches of the new one-tonner released early last year. The overall surfacing treatment and individual design details evident within the body are similar to those adopted by the V-Class in a move clearly aimed at linking it visually with the rest of Mercedes-Benz’s existing commercial vehicle line-up. The front ends of both of the new concepts feature unmistakable Mercedes-Benz styling touches, including the German car maker’s traditional grille treatment with a prominent centrally mounted three-point star emblem along with the company’s latest headlamp lineage. A prominent scuff plate integrated into the lower section of the front bumper and winch on the powerful Adventurer attempts to convey the go-anywhere appeal of the new pick-up, which will be offered with both in a range of differing styling lines in a bid to provide it with what one Mercedes-Benz official described as the “broadest possible market reach”. By contrast, the stylish Explorer sets out provide the X-Class with a more athletic touch, with a power dome within its bonnet and heavily flared front wheel arches that help to emphasise visual width while providing the new pick-up with the ability to house wheels up to 22in in diameter, as sported by the more road biased versions of the new X-class concepts. Four conventional front-hinged doors provide entry to the cabin, which receives two individual seats up front and a bench seat in the rear capable of accommodating up to three adults in the Explorer concept. Behind its cabin, the X-Class features a pick up bed similar to those featured on the Nissan Navara and Renault Alaskan, while each of the new concepts adopt their own unique tail lamp treatment within the tailgate section; the Explorer flaunting a full width oval shaped graphic and the powerful Adventurer more conventional vertically stacked units on either side. The latter also features rails within the sides of the pick up bed. The loading carrying potential of the new Mercedes-Benz pick-up is put at 1100kg, while the towing capacity of the range-topping diesel V6 model that will form part of the initial wave of X-Class models in selected markets is a claimed 3500kg. Inside, the dashboard and cabin appointments are modelled closely on those of the latest V-class commercial vehicle, complete with various touches from the C-class, including a free-standing central monitor as well as a rotary controller with integrated touchpad functions for the infotainment system. Carry over items from its sister pick-ups, the Nissan Navara and Renault Alaskan, include a traditional cable operated hand brake together with various controls within the centre console, including those for the air conditioning and various driving assistance systems. Among the features set to appear on the production version of the new Mercedes-Benz is a so-called communication module featuring an onboard SIM card that will enable owners to communicate with the infotainment system directly from their smartphone. Safety has also taken a prominent role in the development of the new pick-up, which Mercedes-Benz says will receive many of its existing camera, radar and ultrasound sensor based driver assistance systems in a move officials suggest will place it at the top of the pick-up class in terms of both standard and optional passive safety equipment. The head of Mercedes-Benz’s commercial vehicle division, Volker Mornhinweg, has confirmed the first variant of the X-Class will offer seating for five and be pitched as what he describes as an “urban lifestyle and family vehicle” much in the mould of the stylish Explorer. A range of accessories, including a bed cover, will enable customers to customize the new pick-up from the outset of sales. A more utilitarian follow up model is expected to get a more rugged appearance and off-road options in line with look and features showcased by the powerful Adventurer concept. Mornhinweg says Mercedes-Benz’s commercial vehicle division has identified five different customer groups for its latest model: families, tradespeople, land owners, adventurers and 'individuals'. “We will thus appeal to new customers who have not considered owning a pick-up before,” he says. Among the engines planned to power the X-Class are yet-to-be-specified four-cylinder petrol and diesel units, supplied by Nissan, together with the top-of-the-line Mercedes V6 gasoline engine showcased in the concepts of the Mercedes-Benz pick-up revealed in Stockholm, Sweden. Alongside standard rear-wheel drive for lower end models, the new pick-up will also receive a 4Matic four-wheel drive system as an option (standard on the V6) in combination with a transfer case offering low-range gearing, on-demand differential locks and electronic traction control for added ability away from the bitumen. Underpinning the new Mercedes-Benz is a ladder-frame platform and uniquely tuned version of the chassis used beneath the Nissan Navara and Renault Alaskan, with a MacPherson strut set-up at the front and a unique five-link suspension set-up at the rear, developed by Mercedes with bespoke track width settings. 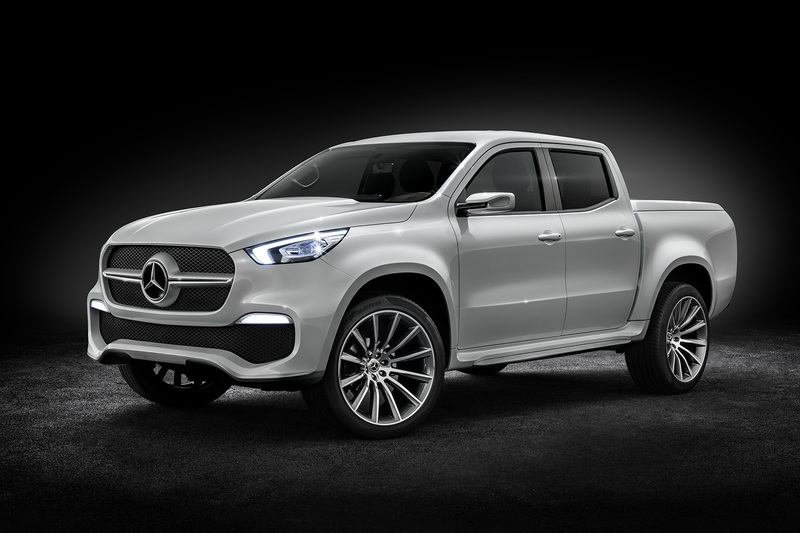 With the introduction of the X-Class, Mercedes-Benz intends muscling its way into a global mid-size pick-up market put at around 2.3 million per year. The undisputed global market leader is Toyota, which traditionally shifts around 700,000 of its Hilux/Tacoma each year. Central to the up-market competition for the new pick-up is the recently facelifted Volkswagen Amarok. Among the main markets being targeted by Mercedes-Benz with the new X-Class are Australia, Argentina, Brazil, Europe and South Africa. Production for the Australian, European and South African markets will kick off at an existing Nissan factory in Barcelona, Spain in 2017. The X-class for South American markets, including Brazil and Argentina, will roll off assembly lines in Cordoba, Argentina beginning in 2018. Good looking and not overly detailed, but I fear it's a long way from the traditional engineering led approach of Mercedes from a couple of decades ago. The styling is nicely Mercedes Benzish, as are the engines, but the main structure and thus most of the actual engineering is by Nissan. Well done Mercedes, only 15 years late to the party. JLR's arse will be in their hands since this was announced, McGoverns premium turd making machine will be in overdrive. Couldn't they do a "Pathfinder" type SUV? I do a lot of cycling and some of my mates have Hylux's, etc. I'm never convinced about the security of having a bike in the pick up bed (locked, obviously). That's why, if you want this kind of vehicle then a Nissan Pathfinder always made more sense to me. Also, a SUV style X Class could be seen as a modern and "cheap" G Wagon. It's a Nissan with a 3-pointed star. "Underpinning the new Mercedes-Benz is a ladder frame platform and uniquely tuned version of the chassis used beneath the Nissan Navara and Renault Alaskan..." How very sad that this is what a "Mercedes" is these days. That's a Navara with a Benz nose. I'm not sure who the market for the X-class will be. Arabian dune bashers or rich city kids in Australia? The market for premium sheep-haulers seems rather limited. The Toyota Hilux sells in huge volumes worldwide because it's a cheap and tough old thing. Compare that to the VW Amarok which limps along with few sales outside Europe.